[ARCHIVE] neoBrainformation • View topic - Snails. Snails love Lupins & Marigolds. I put some in my garden & they were scoffed by the snails the next morning. So I put some more in & surrounded them with "slug slam". The next morning it was like the bloody killing fields! Dozens & dozens & dozens of dead snails. The hedgehogs obviously can't eat 'em all. i'll have em with a smattering of garlic......yum..
i'll pass! but thanks for the tip, claire, i have a damned battle with the slimy ones. They taste like chicken Tomsk, so ... not as bad as you think. Don't eat any that have died from poisoning, tho'! Gosh no - but edible snails are bred in captivity, so to speak, so you're pretty safe if you go to a restaurant and order them. It's rather sad really, because I like snails. The thought of them being put on a hot plate and frazzled ... well it's not too good is it! Last edited by Ice.Maiden on 12 Mar 2011, 19:09, edited 1 time in total. I know ... I don't like it at all when the animals we eat are not put to death quickly and in a humane way. I like lobster and crab, but I can't eat them anymore because I just know they suffer terribly by being boiled alive. I know - it's horrible, and a snail is no less than a crab or lobster when it comes to feelings - and I like to eat all three! I DID do a good deed the last time I visited the Canaries though. I pestered my OH to buy a lobster, which was crawling morosely in the bottom of a tank, awaiting its fate, with an elastic band round its pincers. We bought it, and let it go in the sea again. Just hope it wasn't caught for a second time. You are a delightfully fine human being, Icey! I'd have bought the lot, but there are so many sea-front fish bars selling them. Very sad really. 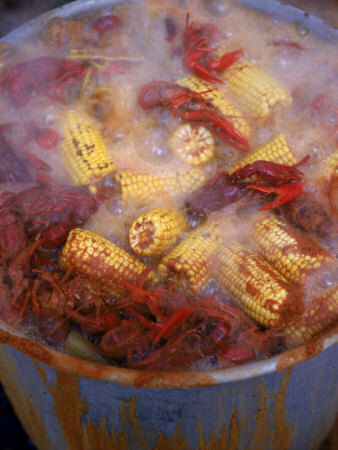 I'm almost embarrassed to say it now, but I love boiled seafood...especially crab, lobster, and crayfish! "Help me! HELP me! AAAAA....!" I'll pass on the snails, though...tried it, didn't like it. I prefer seafood to meat actually, but yes, crab, lobster and crayfish .... lovely. Paella's nice if made properly. I don't like squid adding to it though.